As part of the TOMODACHI Generation, what future do you envision for us? Thanks to one of my male friends who told me about the TOMODACHI Metlife Women’s Leadership Program in 2013, here I am stand today, the place I would never be able to imagine when I applied and was selected as a participant. This 10-month mentorship program pairs highly-motivated Japanese female university students with Japanese female mid-career professionals to encourage networking among a select corps of Japanese women who show promise as Japan’s next generation of leaders. Last year, participants were from Tokyo and Osaka, but this year it expanded to Fukuoka and Naha. The program brings all students to Washington DC and to New York to expose themselves to American women’s leaders from government sector, corporate world as well as non-profit sector. Students learn importance of taking risk, not being afraid of making mistakes and becoming confident from those inspiring leaders. The biggest take away for me was the all the inspiring leaders had one thing in common and that was an ability to ‘bring people together’. This realization was little surprising for me since each professional was already competent, skillful and powerful enough to move forward. However, they cherish teamwork and respecting each other to produce even greater outcome. This is the time I realized the importance of gaining trust. I believe these opportunities to expose ourselves to different culture and receive top-quality training are still extremely rare for Japanese students, and as a matter of fact this program was a beginning of my whole new journey. 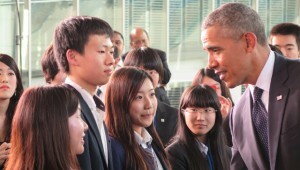 On April 2014, 5 of TOMODACHI Alumni met President Barack Obama while he was visiting Japan. We were able to listen to his speech closely, shake hands and speak with him. When he mentioned the importance of tackling issues of climate change, it hit me at that moment, ‘This is it’. Environmental issue in particular was issue which individual can only do little, but require collective wisdom and action. As a member of the TOMODACHI Generation who appreciates cross-cultural engagement, this coincide with my passion and my search of what I wanted to do. I told the President ‘I think I have found my dream’, I will never forget his warm, comforting hands and his caring smile looking straight at my eyes and how much he encourage me to move forward. On March 2015, the First Lady of the United States, Mrs. Michelle Obama visited Japan as well to promote a world-wide campaign ‘Let Girls Learn’. She has also mentioned the importance, potential and necessity of multi-national collaboration to tackle social issues. As a TOMODACHI alumna who was fortunate to have the extraordinary experience of meeting the President of the United States, I wished to be more involved in the TOMODACHI Initiative. 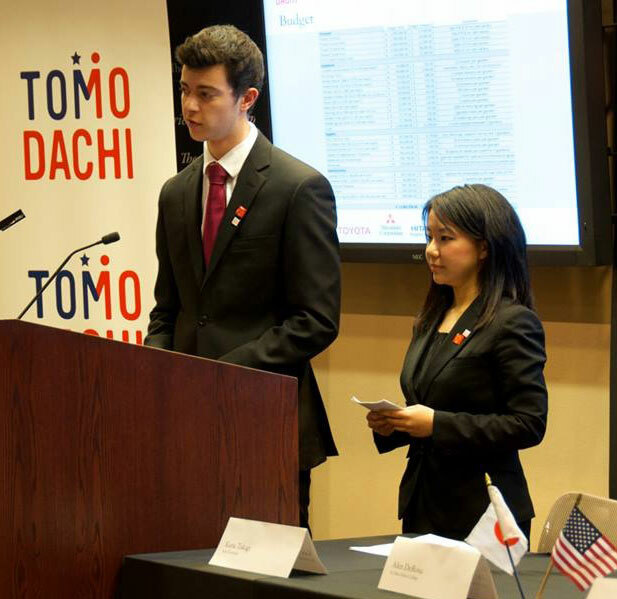 That is why from September 2014, I started interning at the TOMODACHI Initiative. As an intern, I help out at various events, create documents and lists, meet with alumni from all TOMODACHI programs to collect their stories, and attend conferences to develop my own network. My personal theme for the internship is to gain a ‘trust bank’. Day by day, not only do I perform my tasks but always keep in mind what I have done within limited amount of time. It is a perfect opportunity for me to put what I have learned in TMWLP into practice. My internship experience provides me with opportunities to gain responsibilities, to grow, and to learn from mistakes. 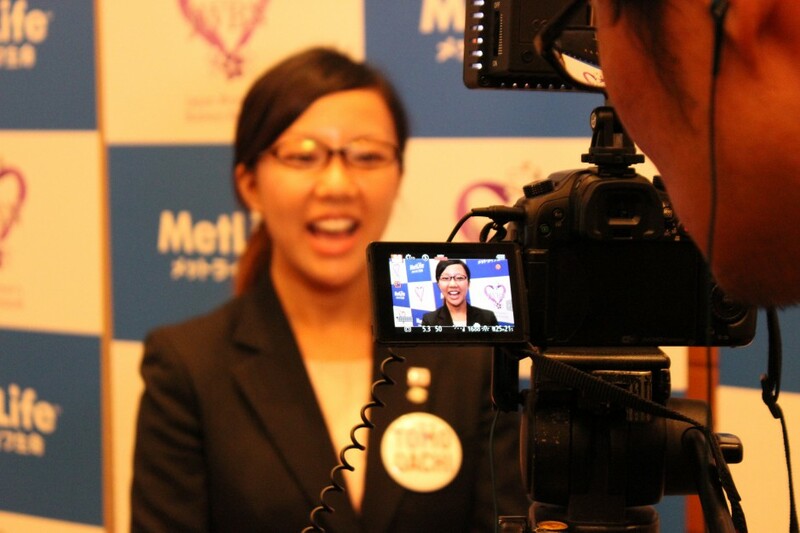 One year after I participated in TMWLP, we were invited to attend Metlife Global Women’s Issues in Japan at WAW! Tokyo 2014 Event. In front of hundreds of audience, I asked the panelists the strength of Japanese society in terms of developing future leaders. Asking a question in front of such a large number of people was unthinkable before I participated in the program, but I was not afraid of taking a risk anymore. What made this experience even memorable was because of a remark by my very role model. After the event, Ms Mari Matthews from MetLife, who had supported our program from the very beginning, told me ‘You have changed so much, a year ago you were very quiet. I am very happy to see you grow.’ I was taken by surprise that she remembers me as an individual and by her thoughtful passion and belief towards nurturing next women leaders in Japan. Even in present-day, I choose not to stand out in the crowd, rather I sit back and obverse people. I have studied abroad for one year when I was in high school, but I am not a returnee. But I could proudly say that I studied English with my full effort. If younger people are thinking, ‘my English is really poor because I barely have any experience abroad’, I would like them to look from different perspective. I want you to think in terms of ‘what kind of person you are’. Since I am not a returnee, I immersed myself with Japanese educational system, custom and tradition. I am truly grateful for the path I went through as I strongly believe it made me who I am today. But the experience through TOMODACHI, interacting with American culture made me even more aware of my identity. I was able to knowledge the preciousness and value of cross-culture activities, respecting and learning from one side and understanding ourselves, through Building the TOMODACHI Generation. The Building the TOMODACHI Generation Program is a two-week program which brings together Japanese and American college students to Washington DC to learn about non-profit and its cross-sectorial relationship and develop our own projects with a focus of rebuilding Tohoku region. The same level of lectures, workshops and speakers regarding to this field would be unable to receive in Japan. Although after 3.11 or Kobe Earthquake, Japan has experience an increase in number of volunteers of NGO, and many scholars and researches indicate an importance of non-profit sector in Japan, its infrastructure is extremely fragile, especially when we compare with those in the United States. In order to foster non-profit sector in Japan, cross-sectorial collaboration and understanding is necessary. 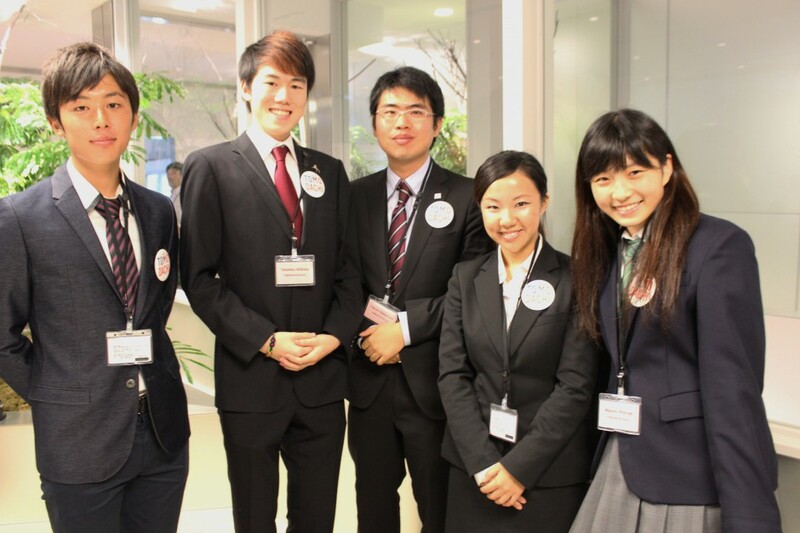 Japanese students consists of those who will work for a government, who will go into a corporate world or who is a freshman who is studying to become a doctor. This unique group of people was very epitome of future of Japan. After participating in the program, I became determined to build an infrastructure for the non-profit sector in Japan, a sector which I believe would be a place where people who are ambitious and try to make a difference can maximize their full potential and positive impact. I believe that countless voices are still unheard in Japanese society. One might find it interesting that there are as many civil society organizations as convenience stores in Japan. However majority of them are ‘grass-root’ organizations where in the United States civil society often refers to advocacy associations. I strongly believe that Japanese society needs advocacy organizations which enable those unheard voice heard. In the same manner as business or politic, operation of non-profit is a science; it requires expertise, analysis, experience and professionalism. As one of the few students who were fortunate to learn about non-profit sector’s functionality, I will continue to devote myself for U.S.-Japan relation and further learn and develop a network. So that ultimately I could give back to Japanese society. Prime Minister Shinzo Abe and President Barack Obama announced a statement of promoting broader people-to-people exchange between Japan and the United States. To ensure the future strength of the U.S.-Japan relationship, the two governments share the goal of doubling two-way student exchange by the year 2020. It also states that a broad people-to-people exchange between Japan and the United States has been a key pillar of our Alliance. The value of ‘people-to-people connection’ is only realized in a long term and by nature it is one of the most intangible concepts. However, those who devote themselves to building up this connection, including myself, have a strong belief in this potentiality and certainty. Through BTG program, I truly felt this ‘people-to-people’ connection which will last for rest of my life because I would never forget the face of my teammate and warm hugs after the presentation. This was something I could never experience if I had not gone out of my comfort zone. The expression and hugs were warm, caring and strong. It was truly when we ‘ishin-denshined’, (understanding each other even without many word). This is obviously a Japanese culture, but through respecting each other, learning and working together, Japanese could learn so much from US students and hopefully vice versa. If no one knows where my life ends up, I take full responsibility of my own journey. I will take a risk, will make a mistake and do it rather than regretting. At the same time, I am very scared too. However, TOMODACHI made me realized and gave me an opportunity to be part of such a wonderful network of people who I can truly believe.